No other Bible portion has created as much controversy between Christian and Jewish people as the Suffering Servant in the Book of Isaiah (52:13 – 53:12). According to traditional Jewish teaching, the Suffering Servant is the nation of Israel. The traditional Christian interpretation proclaims this same portion as prophetic concerning the Messiah. Christians declare this prophecy fulfilled through Jesus. Jewish scholars claim that Christians are falsely reading Jesus into this chapter; purposely forcing a “private interpretation” to suit their own beliefs. For their part, Christians claim that their’s is a literal and normal understanding, and the oldest interpretation. They often cite the times Isaiah 53 is either directly quoted or alluded to in the New Testament as proof of its accepted messianic interpretation during the first century. The problem with this argument is that Jewish scholarship does not accept the New Testament as Holy Writ. To solve this dispute there must be found authoritative Jewish interpretations proving the Suffering Servant to be the Messiah rather than Israel. If such evidence exists, it is equally important that it be older and therefore more authoritative than the presently accepted Jewish thought. Such evidence does exist and it is worthwhile to note the Rabbinic Anthology of the Suffering Servant of Isaiah. The earliest authoritative Jewish teaching concerning the Suffering Servant is found in the Targum of Jonathan. A Targum is an Aramaic translation or paraphrase of the Old Testament. From after the return from Babylon until the mid first century BCE, Aramaic gradually replaced Hebrew as the common language of Jewish people. Since Hebrew was still the language of Scripture it became necessary to provide translations to aid in understanding the Bible when it was read at the religious schools or worship services (e.g., Neh. 8:1-8). By the mid-first century BCE the Targums were considered authoritative within Judaism and thus quoted in the New Testament. The Targum of the Books of the Prophets is the work of Jonathan ben Uzziel, who gives the authorized interpretation, handed down from one generation to another since early times. This translation is named for him; the Targum of Jonathan. According to the Babylonian Talmud, he was the most noted out of the eighty students of Hillel the Elder (20 BCE- 20 CE). Historians place him in the early–mid first century CE. Contained in this Targum is the oldest received interpretation of the Suffering Servant. In it Isaiah 52:13 is translated, “Behold, my servant, the Messiah, shall prosper; he shall be exalted, and increase, and be very strong.” We may conclude from this that the oldest correct interpretation of the Suffering Servant is that of Messiah, not the nation of Israel. Both the Zohar and the Talmud, the two oldest and most respected Jewish bodies of legal and revered writing, inform us that the Suffering Servant is The Messiah of God and not the nation of Israel. Judaism solidly taught that the Suffering Servant was the Messiah until a very influential Talmudic commentator Rabbi Shlomo Itzchaki, 1040-1105 CE (called Rashi) and some of the later rabbis began to interpret the passage as referring to Israel. In Rashi’s own words this was a defensive move to take away the case made by Christians that the Suffering Servant was fulfilled in Jesus. Rashi lived at a time when Christianity encouraged the persecution of Jewish people. Although he could do little to stop the murder and forced conversion under penalty of death, he and others wanted to safeguard the Jewish people from theological attack. Although Rashi and others had sincere intentions, they were wrong. Important Jewish rabbis and leaders realized the inconsistencies of Rashi’s interpretation. They presented a threefold argument: first, the agreement of the older commentators; second, that the text is in the singular; and third, they cited verse eight. This verse presents an impossible situation to those who interpreted this passage as Israel. I am pleased to interpret the passage in accordance with the teaching of our Rabbis of the King Messiah … and adhere to the literal sense. Thus shall I be free from forced and far-fetched interpretations of which others are guilty. This prophecy was delivered by Isaiah at the divine command for the purpose of making known to us something about the nature of the future Messiah, who is to come and deliver Israel. Our Rabbis with one voice accept and affirm the opinion that the prophet is speaking of the King Messiah, and we shall ourselves also adhere to the same view. In this short article my point has been to demonstrate that there is a considerable, credible, consistent, and authoritative body of proof from Jewish primary sources testifying that the Suffering Servant is the Messiah. With these proofs available to the Jewish people why is there still a controversy over this portion of Scripture? Perhaps in the Jewish mind things have not changed much since the days of Rashi. Most Jewish people still view themselves as under attack by a hostile Christian world that seeks to strip them of their Jewish identity. As it was in Rashi’s day, the desire for self-preservation and peace goes beyond the desire for truth. Without realizing it, they have overthrown the very foundations of the Jewish religion by overthrowing the older and more authoritative teachings. They have broken the line of authority that goes back to the Prophets and have devised new ideas to suit the social situation. This has removed the Word of God from its place of primary importance and replaced it with the word of man. If my people truly are looking for peace, a sense of peoplehood, and pride in being Jewish, let them do as Jeremiah said and “ask for the old paths, where is the good way, and walk therein, and ye shall find rest for your souls” (Jer. 6:16). Isaiah 53:7-8, cf. Acts 8:26-35; Isaiah 52:15, cf. Rom 15:21; Isaiah 53:1, cf. John 12:38; Isaiah 53:4, cf. Matt 8:17; Isaiah 53:9, cf. 1 Pet 2:22; Isaiah 53:12, cf. Mark 15:28, Luke 22:37. Isaiah 53:5, cf. Romans 4:25; Isaiah 53:7, cf. 1 Pet 1:19, Rev 5:6, Rev 7:14; Isaiah 53:7, Isaiah 53:11, cf John 1:29,36; Isaiah 53:9, Isaiah 53:11, cf. 1 John 3:5; Isaiah 53:8-11, cf. 1 Corinthians 15:3-4, 2 Corinthians 5:21; Isaiah 53:4-6, cf. John 10:11, “Good Shepherd lays down His life for the sheep”, Philippians 2:5-10; Isaiah 53:11, cf. Hebrews 9:28. In Jewish thought the closer in time to the Sages, which Sage was your mentor, or from which generation of Sage you were taught, has direct bearing on how authoritative your writings are. The older writings are generally more authoritative than the newer ones. BCE is used by Jewish sources speaking of Before the Common Era instead of BC (before Christ). CE is used speaking of the Common Era instead of AD (in the year of our Lord). They use these designations because they don’t believe in Christ nor accept Him as Lord. Matthew 27:46 gives the Aramaic form of Psalm 21:2; Eph. 4:8 is closer to the Targum of Psalm 68:18 than to the Hebrew text. Babylonian Talmud Megillah, 3a tells that Jonathan was faithful to carry on the interpretation of Scripture received by Haggai, Zechariah, and Malachi. Sukkah (28a = baba bathra 134a). S.R. Driver & Adolf Neubauer, The Suffering Servant of Isaiah According to Jewish Tradition, p. 203. I was looking for a credible JEWISH source for my article and low and behold I find this. HaShem forgive you for trying to take away the Jew from the Torah. JC, Yeshua, is not now, nor ever will be the Messiah of Israel. At best, if he truly existed, he is messiah to the non-Jew, for because of him, the Torah was given to the world, something we the Jews forgot to do. But, stop and desist. JC is based loosely on a conglomerate of many between 30 BCE and 30 CE. Research for yourself. From his virgin birth, to dying on the cross, he resembles too many ancient pagan gods to ever be a Jewish messiah. Preach to the non-Jew, but stop doing this to HaShem’s chosen, or you will pay and you will start to pay today. Like you I am looking for some good Rabbinic sources. I know that “J” IS NOT HaMoshiach. The newest tactic of “messianics” is to quote the ancient rabbis as the authority on this and ignore the Tanakh. How is it that they are willing to believe the ancient Rabbi’s on Isaiah 53 and ignore everything else they say? How do you defeat this tactic? You recently replied to a comment made on an article of mine that appeared on the Jewish Awareness Ministry web-site. I have left a comment there for you if you care to read it. You recently commented on an article of mine that appeared on the Jewish Awareness Ministry web-site. I have left a reply there for you if you care to read it. Yeshua lived, died, and resurrected as foretold by the Hebrew prophets and told by the Jewish writers of the New Testament. Your rejection of the Tenach and the prophecies of Messiah is at your own peril. I suggest you put aside your preconceived ideas, your adherence to Rabbinical teaching, and return back to the teaching of our Holy Scripture. You will be amazed at what you learn from the Hebrew Scriptures if you do this. The devil is very real. He is the great counterfeiter and deceiver. It is no wonder that he has incorporated biblical truths with religious errors to produce pagan gods and false religions. Again, reject paganism, rabbinical beliefs, and preconceived ideas and go back to the source – the Tenach. If you do this with an open, unbiased mind and heart, you will be confronted with Yeshua as the promised Messiah of Israel. I appreciate your comments and your zeal in honest inquiry concerning Isaiah 53. When I researched and composed this short study I did so not for the purpose of proving Yeshua to be the Messiah of G~D, but rather to show how the rabbinic argument concerning Isaiah 53 changed over time. Until the period of intense Christian persecution of Jewish people during the Inquisition the debate among scholars was one of overwhelming support that this portion described the Messiah who suffers the penalty of sin in place of the people of Israel. With the inhumane treatment of Jewish people (only exceeded by that of the Shoah) at the hands of those who claim to worship the G~d of Israel through the Messiah of Israel, the tone of the argument changed to overt denial that this portion represents the ministry of the suffering Messiah. The majority then accepted the argument that it is the Jewish people who are being made a sacrifice for the sin of the Gentile nations. This interpretation has several variances but you get the idea. IF you will carefully read the article you will see that I did not use it to try and prove that Yeshua is the Messiah; that is something that the two of you assumed from your reading of the article. Your association of the portion with Yeshua was exactly what Rashi was trying to neutralize by his support that Isaiah 53 was never about the suffering Messiah. Both of you have indicated that you are absolutely positive that Yeshua could not be the Messiah. I am curious to know what you base this on; commentary, emotion, tradition, or the Tanakh? If you base this on the Tanakh do you read it through the prism of the same commentary that you have chided me for presenting? I am hopeful that you have taken the words of Isaiah seriously when he asked, “Who will believe our report?” He is asking a very simple question; do you take the words of the Prophets, who spoke and wrote the Word of G~D, to have more authority than the words of the rabbis? As for me, I do believe that Yeshua is the Messiah of G~D. I don’t base that on rabbinic commentary, emotion, or anything except, as Leah has suggested, the Tanakh. It is there that we learn how Messiah will be born, when to expect his birth, where he will be born, why he must come at all, why he must suffer, and the kind of death he would die. Also in the Tanakh we find clear understanding of his character and nature. If either of you two would like to discuss these things then you are welcome to contact me directly or we can keep this in the public as we are doing now. You can obtain my e-mail address by requesting it through contact with JAM from this web-site. if you want to discuss, reach me at my email. Sorry it took me a year. I have read this book and accept your offer to discuss the misconceptions concerning the Messiah that are held by the author as well as to look at what the Scriptures teach us about Messiah. Where do we start? I have just come across your site and appreciate the wealth of info you gave concerning the rabbinic anthology of the suffering servant. The reason I’m writing to you is because I have recently come across a web-post debate between a believer and what I assume to be a counter-missionary on an Amazon website, and found it disturbing as to how it concluded. Too often this is the case in such debates, though not always. I have copied and pasted the portion of the debate I thought was pertinent to my question (below) with the URL address link intact. It appears that the supposed anti-missionary had the upper hand in this debate by simply refuting all claims made of a list of early rabbis who supposedly made quotes that supported the interpretation that Isaiah 53 referred to Messiah. He did this by stating that they simply do not exist. I concluded he had the winning argument by the simple fact that the believer, who brought up the names, did not appear to have any sort of refutation and/or reply of location where any of the quotes actually were sourced from. It seems that the most effectual means anti-missionaries have of discrediting believers these days is in their questioning the sources of any evidence that believers use in support of their faith; a major one being the quotes of the early rabbis that proclaimed that Isaiah 53 spoke of Messiah and not Israel. Would you be able to give validity to any of the names (below) paired with the supposed Isaiah 53/Messiah quotes by citing the original source location(s) (i.e. document/book, chapter, paragraph, page number, etc. ); where they can be found? No sense in using any of them if none are valid or have the means to be proven. Thank you for your response, Sarah. The tractate Pesikta Avkat Rochel. :Thank you for your response, Sarah. The quote simply does not exist. It was created out of whole cloth. Ditto. His commentary on the Bible is quite well organized and I can show you exactly what he DOES say about Isaiah 53. However, you’ll be disappointed. He never uses the word messiah or even makes reference to the concept. Again, invention. I scoured the Zohar for the quote you cited. I have even searched digital copies. The quote is just an invention to bamboozle poor Jews. :The tractate Pesikta Avkat Rochel. Where does it say this? I admit that I have not made it through the entire Talmud (although I have made it through Yerushalmi and a good chunk of the Babylonian Talmud) but I have never found this passage. I have read all of Ayn Ya’akov, so if it were in the Talmud, I imagine that it would have been cited there. I’ve got a Babylonian Talmud in the other room. If you can give me a citation, I’ll look it up now. I am going to ask Moshe to respond to your inquiry. I am not sure about the comment “sacrifices ‘lost their effect? '” 40 years before the destruction of the Temple. There is an interesting comment from the Talmud about 4 things that did take place in the LAST 40 years of the 2nd Temple. 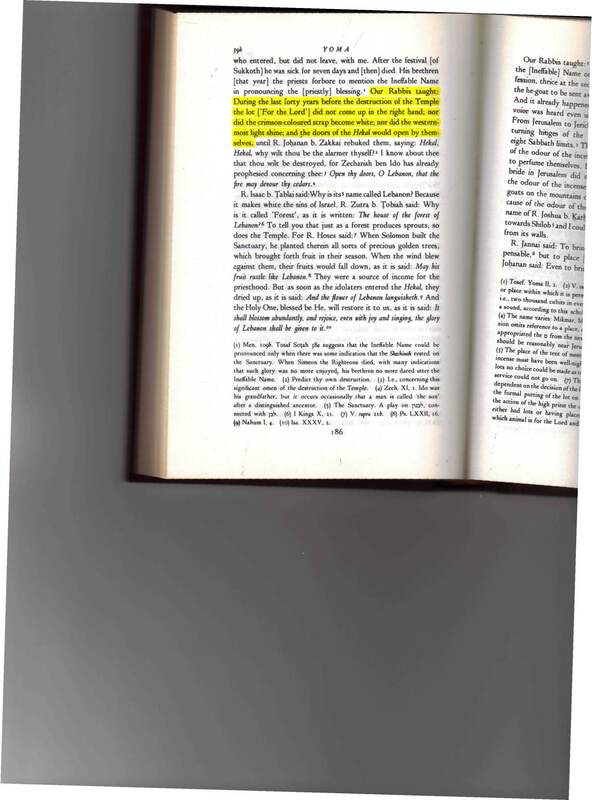 I have attached this page from the Talmud with the pertinent passage highlighted in yellow. What these 4 things represented is fascinating in light of what Jesus did and represents as Messiah. What you have encountered is a long standing change in the direction of Jewish response to proof either from the Jewish Bible, Talmud or authoritative writings. The change was calculated and reactionary. For example in the Bible the use of the word almah for virgin in Isaiah 7:14 is descriptive of a woman who has not had sexual relations and this word needs no further clarification as to the condition of such a woman. There is another word used for a virgin, bitulah, that needs conditional clarification because it can refer to a young woman who may or may not be a virgin. The Jewish commentators have simply reversed the meaning of these words in the context of Scripture so as to diminish the reality of the virgin birth. Today in Jewish teaching the word almah refers to a young woman who may or may not be a virgin and the word bitulah to a virgin. Since the word in Isaiah 7:14 is almah they denounce the virgin birth as built on false Christian teaching superimposed in the Jewish Bible. They have done the same with the word ehad, which in the Bible refers to compound unity; a sum of more than one taken together as one. There is another Hebrew word in the Scriptures that refers to the exact multiple of one; yachid. In Deuteronomy 6:4 the word referring to God is the word echad, which would allow for a plurality of majesty within the Godhead. However, a very famous Jewish teacher, known in history as the Rambam, reversed the meanings of these words in order to protect the Jewish people from Christian assertion that even in the central anthem of Judaism there is evidence of the triune nature of God. Since then Jewish understanding has followed his teaching. So, with respect to the scholars that I have quoted in the above article it is not uncommon to find that the response is to deny that either these works exist or that the author actually made or inferred the quoted statement or perhaps some redacting has taken place to the present text of those works to exclude original materials that could be used to show the nature of Messiah. In any case the best means of communicating Messiah is still through the Scriptures themselves, which show quite clearly our inability to remove our own sin and therefore our need for God to do it for us, how God does so through the one called Messiah, the nature of the Messiah, the time to expect His appearance, where He would be born, how He would die and resurrect to life, etc. I hope this aides you in understanding that the debate is not to be won or lost in the rhetoric of man but in man’s obedience to present the truth of the Word of God under the leading of the Spirit of God, to people He has prepared to receive it. I became a beliver about 3 years ago, however I’ve recently been more interested in what the actual literal Jewish interpretations convey, which logically lead me to the argument on Isaiah 53. I happened upon several websites referencing that Rashi was in fact not the first to put forth the argument of Isaiah 53 as referring to Israel but was mentioned in Contra Celsum (written 248 CE) after a conversation between Origen and a group of Jews. I’ll attach a link to the site below. I would love to here your insight on this claim. First of all their argument is misleading since Edward Pusey was referring not to some interpretive conclusions held by some Jewish scholars somewhere, but rather to the body of scholars (Talmudic Scholars) whose interpretations were legally binding upon the Jewish religion, meaning all Jewish people. Those responsible for the oversight of the Jewish religion, until Rashi, interpreted Isaiah 53 according to the uninterrupted understanding that it referred to the Messiah. The sources that I have quoted in my article are correct and demonstrate that Rashi deviated from the plain meaning of the Scriptures. Furthermore, Origen’s conversations were with some leaders of the Jewish Community in Alexandria, who did not represent the authorized Jewish position of their own time. The centre of Judaism was never in Egypt and at that time it was under the authority of Judah HaNasi of Israel. Secondly, concerning Contra Celsus (2), Origen refers, in Book 1; chapter 55, to the Jewish men he once debated with as so called scholars. In reading the English translation of Book 1, one gets the sense that these Jewish men did not appear to him to be very wise or scholarly (see also chapter 45). Those who use this passage to validate the proposition that Isaiah was speaking about the nation of Israel taken as a whole are ignoring the context of Origen’s statements. If you read chapters 54-55 a clearer context of chapter 55 will appear (I have included them below). In these chapters Origen records parts of the Jewishobjections to Jesus as Messiah as well as their argument against Isaiah 53 referring to the Messiah. In each case the men who debated with him were called to task for ignoring the written text of prophetic writing and/or assigning a new meaning to key words of Scripture in order to arrive at their conclusion, for which there is no reply. In other words, they violated the words of Scripture to impose their own meaning. For modern apologists to accept this method of interpretation and to look for historic validation of it in Contra Celsus is in fact to agree with Origen that their methodology violates the text of Scripture and therefore yields a wrong interpretation. It may be of benefit for you to know a little about Celsus and the Jewish community in Alexandria. Celsus was a pagan philosopher who wrote a book condemning Christianity. Knowing that Christianity sprouted from Judaism and in order to show Christianity as a false religion, he brought questions about the validity of the Jewish Bible, the history of the Jewish people and the purpose of a Savior. He did this to show that there was no basis for Christianity to exist since the Jewish religion was itself built on fables. In addition he brought objections to the Gospel from what he assumed to be a Jewish view-point. Sometime after the book was written it came to Origen’s attention and he wrote his own book answering all of the negative charges made by Celsus. The Jewish Community of Alexandria was, like the Christian community, immersed in Platonic thought and, much like the Christians leaders there, they tried to reconcile Greek philosophy with their faith in God. One result was to employ the allegorical or spiritual interpretation of Scripture in which what is written is not as important as finding a hidden meaning (3). This was how some of the men of Alexandria could come to the conclusion that Isaiah 53 referred to Israel and not to the Messiah. They were looking for answers as to why Jerusalem had been destroyed and the Jewish people scattered. While Jewish people of Alexandria correctly concluded that they were being chastened as a people group for sin; by employing the methods of interpretation that the pagans used for their philosophical works, they wrongly concluded that Isaiah 53 held that proof. This type of interpretation of Scripture is called a private interpretation, which Moses, the Prophets and the New Testament warn about. Now I remember that, on one occasion, at a disputation held with certain Jews, who were reckoned wise men, I quoted these prophecies; to which my Jewish opponent replied, that these predictions bore reference to the whole people, regarded as one individual, and as being in a state of dispersion and suffering, in order that many proselytes might be gained, on account of the dispersion of the Jews among numerous heathen nations. And in this way he explained the words, “Thy form shall be of no reputation among men;” and then, “They to whom no message was sent respecting him shall see;” and the expression, “A man under suffering.” Many arguments were employed on that occasion during the discussion to prove that these predictions regarding one particular person were not rightly applied by them to the whole nation. And I asked to what character the expression would be appropriate, “This man bears our sins, and suffers pain on our behalf;” and this, “But He was wounded for our sins, and bruised for our iniquities;” and to whom the expression properly belonged, “By His stripes were we healed.” For it is manifest that it is they who had been sinners, and had been healed by the Saviour’s sufferings (whether belonging to the Jewish nation or converts from the Gentiles), who use such language in the writings of the prophet who foresaw these events, and who, under the influence of the Holy Spirit, appiled these words to a person. But we seemed to press them hardest with the expression, “Because of the iniquities of My people was He led away unto death.” For if the people, according to them, are the subject of the prophecy, how is the man said to be led away to death because of the iniquities of the people of God, unless he be a different person from that people of God? And who is this person save Jesus Christ, by whose stripes they who believe on Him are healed, when “He had spoiled the principalities and powers (that were over us), and had made a show of them openly on His cross?” At another time we may explain the several parts of the prophecy, leaving none of them unexamined. But these matters have been treated at greater length, necessarily as I think, on account of the language of the Jew, as quoted in the work of Celsus. God is not requesting an opinion or interpretation but an ANSWER to the question who has believed our report? Put your feet in a cool water and relax,the suffering servant in Isaiah 53 is the Lord Jesus of Nazareth.God bless you. It is easy to make a big debate about the Word of God, but usually that only shows how small the wisdom of man is compared to the wisdom of God. Only those who truly seek after the Truth will trust in the answer. May it be that many from all nations will do so. I ran across this again and I do not believe it is by coincidence. Right now we are in the “yameem noraeem” that started on the 1 Tishrai with Rosh HaShanna and culminates on 22 Tishrai where all Bnai Israel and all Bnai Noah will either be written in the book of Life or the book of Death. Denominations no longer matters. There is only ONE Creator. Jews known Him as the God of Abraham, non-Jewish believers know Him as Yeshua JC and our righteous Muslim brothers and sisters know Him as Allah. We all have less than a week to say: God of Abraham (we all know Him by this Name)we want Your Kingdom to reign. We reject the rule of man and all his greed, avarice, hate, anger, conflict, etc. We want for only You to be our soveirgn King and bring Your rule with Your Word to all of Your children on this planet. And that all this be so Your Holy Name YHVH be glorified from now until forever, Amen, Amen, Amen veSelah!